Here it is – – my first post ( with the encouragement of friends and family). 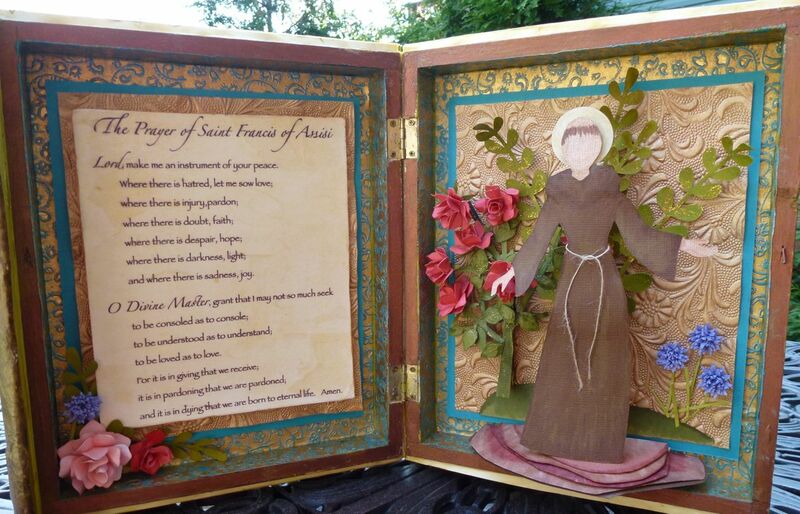 And by means of introduction, here is one of my latest projects – Saint Francis in the Garden. This is my third, and probably final, Saint Francis. Most of the cuts originated with my Cricut. Some were modified by hand, a few were cut by hand, and nearly all were colored or enhanced in some manner. The book “frame” is from the wooden crafts section at the local AC Moore. 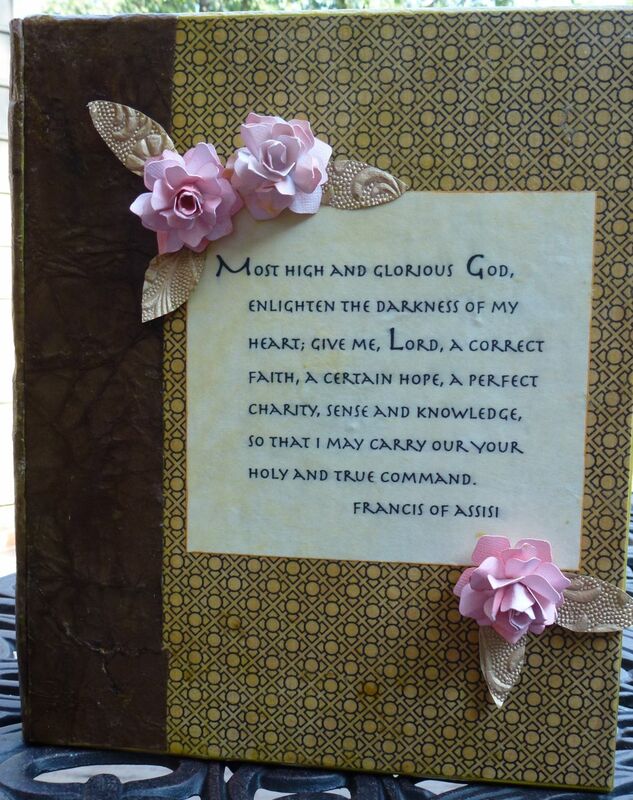 The outer cover, inside background, “pages” and the prayer were decoupaged. 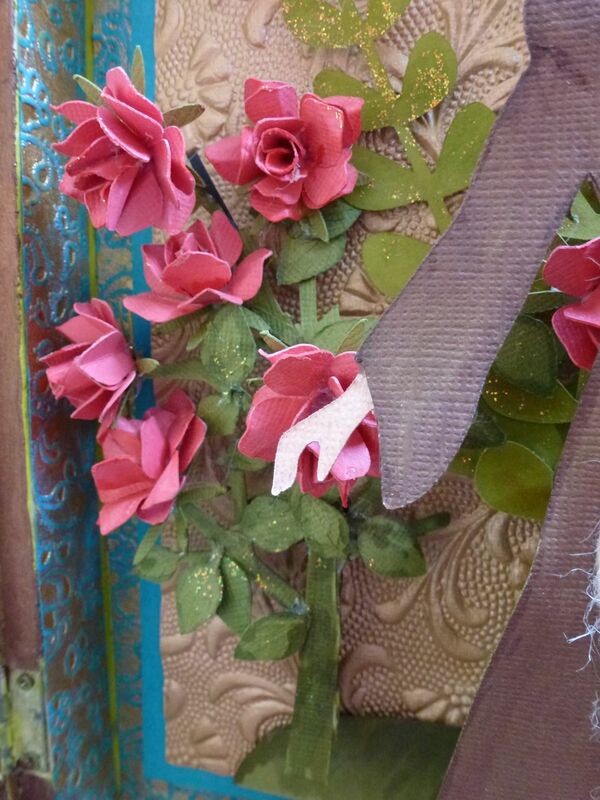 The rose bush behind St Francis was created using Mother’s Day Bouquet and a branch from Picturesque. If all goes well , maybe someday there will be a tutorial posted here. This is a gift for some dear friends who recently professed as Secular Franciscans. I found the message that is decoupaged on the front at the lay organization’s site. Okay – I did it. I will be back eventually to put more of my work up and try to share a few lessons learned along the way. Huzzah!! That is such an amazing project! So glad you finally made a blog :D.
This is so beautiful and unique and wonderful. Nadia was kind enough to show me a photo of what you gave her in Ohio and I am thrilled and amazed. Truly works of art! And I am so very happy that you have started a blog because I can’t wait to see more!! I will stop with this silliness only long enough to tell you how gorgeous your project is. Your flowers are lovely and YES, we want to see tutorials!! Now, I still love the St Francis you did for me the best because it was so special to me and came at just the perfect time… but I love how you reworked it, made it different, but still used the prayer and icon of the figure. You are an inventive and beautiful crafter and I am so glad that you will be sharing your work and ideas on this blog. Oh, if it sounds like I am happy about this, you are reading it correctly! Welcome to the world of blogging! I am so glad you decided to do this! What a gift to us all who enjoy seeing your projects and want to know more about the thought process and technical skills behind them. 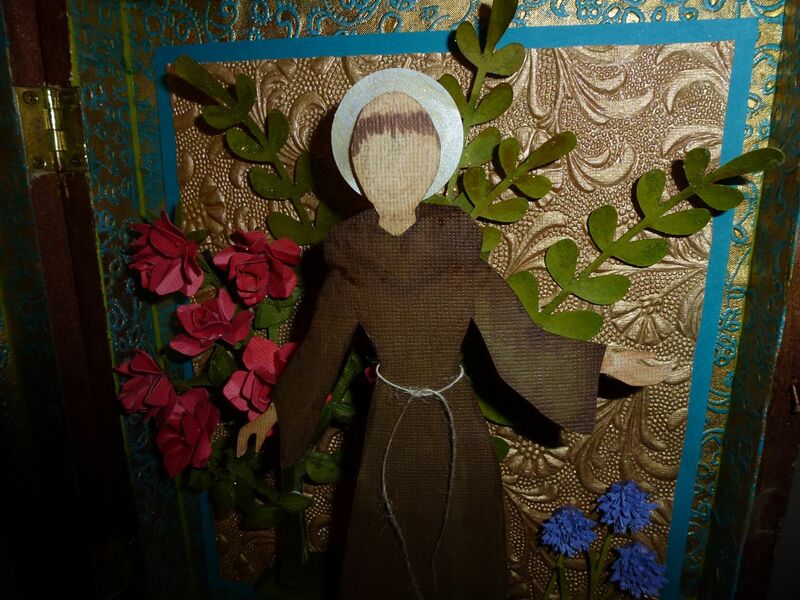 Now… if you decide to do a gallery on this blog (fingers crossed) so we can revisit projects like your winning pennant and that wonderful cake you shared… and who knows what other treasures, and need any of the pictures I took of the St. Francis you did for me, just let me know! Thank you, thank you, thank you for sharing your work! I am off to my blog to add a link to this for my inspiration sidebar! PS– hahaha– love the title of this post. beyond beautiful ever so special! I would love to see more of your work! This is truly exceptional. Thanks for staring a blog, I will be following. This is simply INCREDIBLE! I would love to know where you found the robe for St Francis. I’m going to sign up to follow and anxiously awaiting your new creations. Your work is AMAZING! God Bless!